Erik and I love to celebrate every year. Erik attended an authentic Chinese New Year at his friends house when he was a kid and it holds a special place in his heart. It's a tradition we plan on sharing with our kids someday. 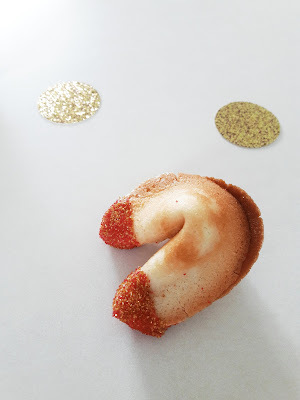 This year I thought it would be fun to try my hand at homemade fortune cookies. 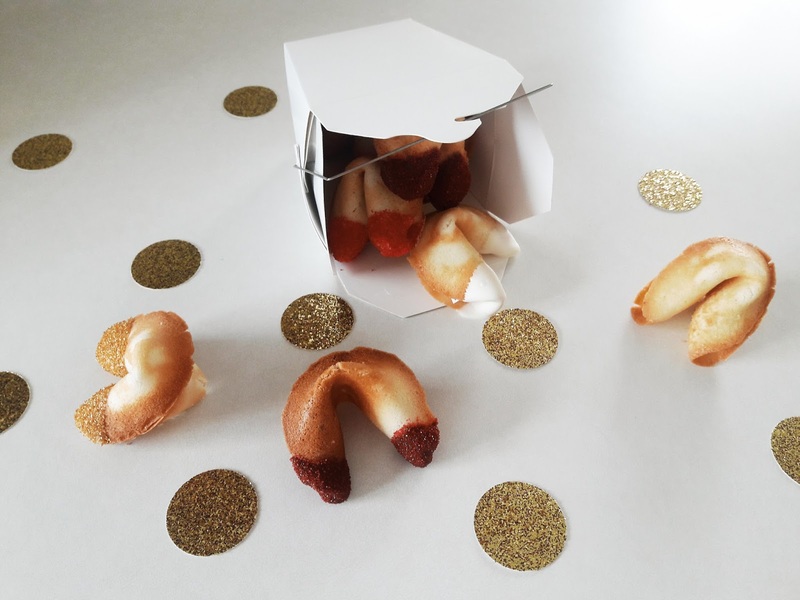 They will need to be ready to place in your cookies. I found mine via Pinterest. Mix egg whites and sugar on high until frothy. Mix in butter, vanilla, almond extract, water and flour one at a time. Make sure each ingredient has been well combined before adding the next ingredient. With a tablespoon, spoon the batter onto a parchment paper lined baking sheet. Spread the batter evenly into a 3 inch circle. Only do 2 or 3 cookies at a time. The cookies set quickly and you will not be able to fold more than 2 or 3 before they set. Bake cookies for 8-9 minutes or until the edges start to brown. If you overcook them they will break when folding. If you undercook them they will tear when folding. Remove cookies from the oven and quickly remove from the sheet with a spatula. Cookies will be very hot! Use gloves or a thin towel to help you shape them so you do not completely burn your fingers. 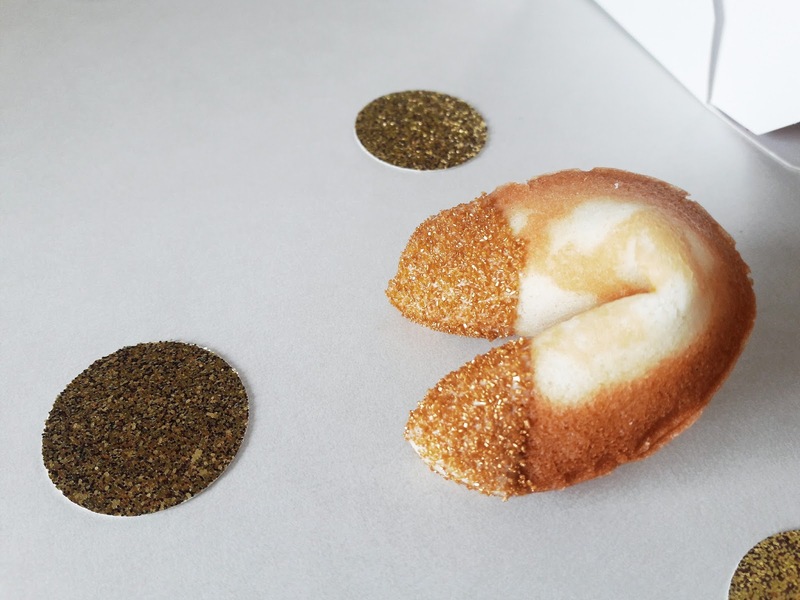 Fold the cookie in half into a semi circle. 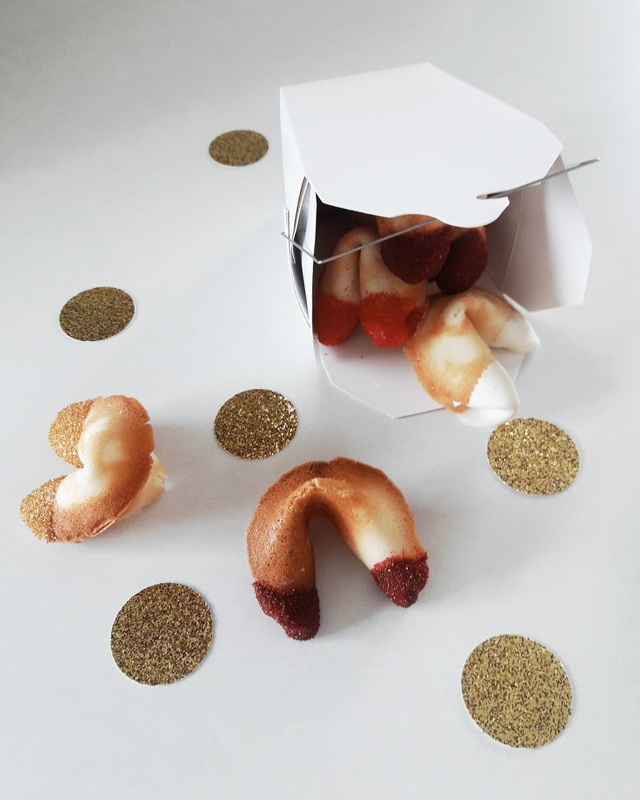 Slip in your prepared paper fortune. Place the semi circle onto the edge of a cup and fold the edges down and into the shape of a fortune cookie. Hold the cookie down to let set and move to a muffin tin to let cool. This will help them keep their shape. After the cookies had completely set I used melted white and milk chocolate and sprinkles to decorate. You can enjoy plain if your prefer. Since we were making these for Chinese New Year I decided to add some decorations for the festivities. Erik and I have held onto this fortune for months. 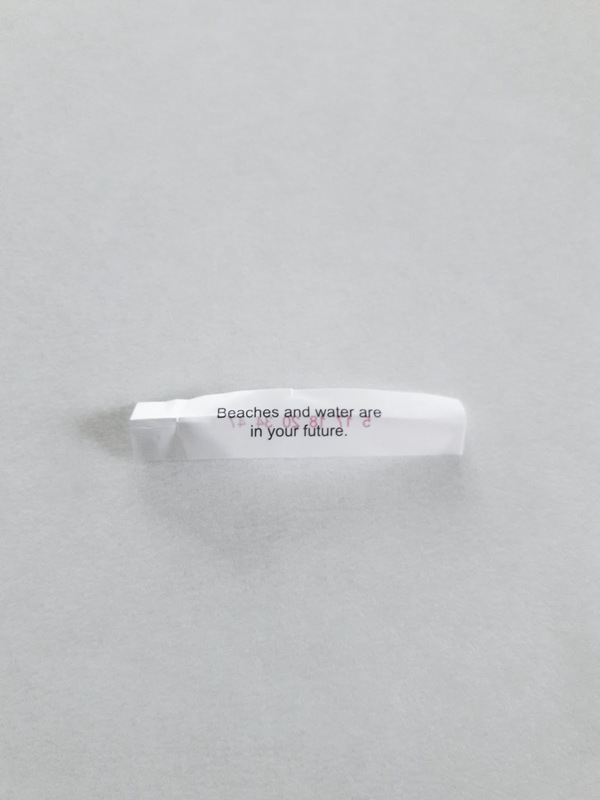 We loved being told beaches and water were in our future. Our five year wedding anniversary is coming up later this year. Erik has been asking if we can go on a cruise. I decided to surprise him and tell him tonight. I took the fortune off of the fridge and slipped it into one of the cookies. I am going to give it to him tonight and tell him we are going! I am so excited to surprise him.